I thought I would write a series of articles about how to correctly setup your riflescope. This will be the first article and it will show you how to correctly setup your riflescope for the optimum field of view. Future articles will cover scope cant, how to quickly and efficiently zero your riflescope and another will discuss calibration of your riflescope and rifle combination using Chairgun Pro. So, what is eye relief? No, it’s not a slice of cucumber on each eyelid or eye drops from the pharmacist. It’s the distance from the eyepiece at which the shooter achieves the optimum field of view. Any closer or further away and the diameter of the visible image reduces significantly. Generally, this is the distance from the eyepiece to your eye and largely depends on the design of the riflescope. Thus it is important to pay close attention to the specifications supplied by the manufacturer when selecting a rifle scope. For example, if you own a spring powered airgun, you should consider using a long eye relief riflescope rather than one with short eye relief. Otherwise, you might find yourself with a black eye or worse! This is even more important for those that wear spectacles whilst shooting as the distance from the eyepiece to the spectacles is even shorter. For example, the MTC Viper Connect has an eye relief of just 30mm compared to the MTC Viper Pro which has a whopping eye relief of 86mm! MTC quite rightly state not to use the Viper Connect with recoiling rifles. So be warned, the Viper Connect is not suited for recoiling spring powered air rifles. Ok, now that you know what eye relief is, how do you correctly position the rifle scope to give the optimum field of view? It really is quite simple. There’s no need to get a ruler out and measure the distance from your eye to the eyepiece. If you did, you’d probably poke yourself in the eye! It really is just a matter of sliding the riflescope forwards or backwards until you achieve the widest image when looking through the riflescope. Rifle scope mount with arrester pin in the base. Sounds easy? It’s not always. For example, if you have a spring powered air rifle, it may have arrester holes near the rear of the rifle. These holes accommodate a pin that is fitted to the base of a riflescope mount and helps prevent that mount from creeping backwards due to the recoil of the rifle. Some rifles have more than one of these holes which allow you to position the rear mount to suit your optimum viewing position. Other spring powered air rifles may not have an arrester hole at all. 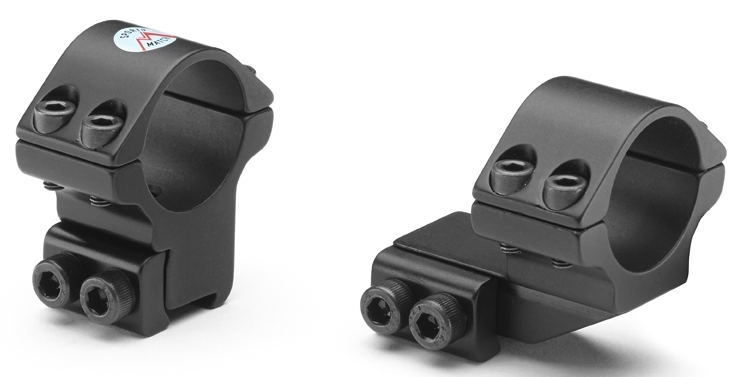 For these, you could use a one piece mount or fit an arrester block behind one of your riflescope mounts. For air rifles that do not recoil, your task is generally simpler as you do not need to worry about a fixed position rear mount. Mind you, some rifles will only allow you to place the mounts in a fixed position such as the Theoben Rapid. If you find that’s a problem you can sometimes find some “extended reach” mounts that can give you some extra room for manoeuvre. Secure your rifle using a gun rest or vice! Start by securing your rifle in a gun vice. You don’t want your pride and joy or the rifle scope falling off as you make adjustments! Remove both upper half clamps from the mounts and then fit the rear riflescope mount to the rifle. If you have arrester holes, start with the mount located over the rear hole and remember to fit the arrester pin. If you don’t have arrester holes, or you don’t have a recoiling air rifle, place the rear mount towards the rear of the rifle as far as it will go. Now fit the forward mount. At this stage, leave the riflescope to rifle clamp screws loose on both mounts. Place your riflescope onto the mounts and fit the upper half rings over the riflescope tube and attach to the mounts using the supplied screws. Again, at this point leave the screws loose so you can make adjustments to the position of the rifle scope. It’s not important at this stage about the position of the reticle so there is no need spend any time on it at this point. Try to position the riflescope so that the mount rings are in the middle of the tube either side of the turrets. This will allow you to be able to slide the riflescope forwards or backwards to achieve your optimum viewing position. You may need to move the forward mount in order to achieve this. Now here’s comes the trick. Shoulder the rifle placing your head against the cheek piece where it feels most comfortable. Hold on a minute! Do this with your eyes closed. When you think you have the right position that feels comfortable, open your eyes. Ideally you should be looking straight through the riflescope. If not, you may need to consider different height mounts, an adjustable cheek piece, or perhaps you’ve just got your position wrong. However, let’s assume everything is just right and you can see through the riflescope. If you can manage on your own, try sliding the riflescope forwards or backwards to achieve the widest image possible. If you find you have run out of travel, i.e. the rifle scope will not move any further, you will need to reposition the mounts on the rifle. Left: scope is too far away. Center: perfect! Right: scope is too close. When you think you have found your ideal riflescope position, put the rifle down and repeat. Once you’re happy that every time you open your eyes that the image is at its best, you can tighten the screws of the mounts. It’s also worth noting the distance of the mount positions in relation to the rifle and the distance of the riflescope in relation to one of the mounts in case you need to remove the riflescope and mounts at sometime in the future. There, you’re finished. “Oh?” you say? What about the reticle? It’s not level. That’s a very good and important adjustment that if you don’t get right, can cause you to miss your target when shooting nearer or further than your zero point. To set the horizontal level of your reticle correctly, read part two of my series of articles of riflescope setup.